Who knew that the saffron crocus only blooms once a year and its purple flower has only has 3 stigmas, and it is these 3 little yellow/orange things that are plucked from the flower which is discarded, to give us the saffron spice? We only know that the sum of money required to purchase saffron seems largely disproportionate to the amount of saffron one gets. 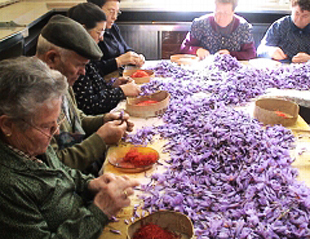 Harvesting the flowers is labour-intensive and a large amount of saffron crocus is required to produce just an ounce of saffron. It is estimated about 85,000 flowers are required to produce one kilogram of stigmas and that will give you an idea how hard it is for this spice to be harvested. The fragile stigmas have to be carefully hand picked quickly and at a particular time of the day, dried and packed. Processing and packaging saffron stigmas takes another round of labour-intensive process. The stigmas have a high level of moisture so drying them properly will preserve them well. This involves roasting them such that they keep their bright red hue, rigidity and plumpness. After that, one kilogram of raw stigmas will reduce to about 200 grams of read-for-consumption filaments. To preserve them, the saffron is stored in big wooden trunks lined with metal plates to protect them from light, heat, cold and moisture.These reasons contribute to making the saffron the most expensive spice in the world, more expensive then gold in weight. Saffron gives a distinctive golden yellow colour, which comes from the carotenoid compound crocin, and a strong aroma derived from the chemical components - picocrocin and safranal. These traits make it a valued ingredient in many culinary cultures around the world. 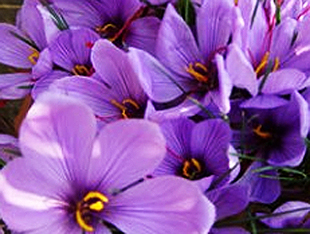 In India, saffron is used in many recipes of rice, sweets and ice creams. Spain is famous for their Paella, Fabada and Pote Gallego, and all of them specifically call for the use of saffron. In Northern Italy and Southern Switzerland, saffron is essential in the preparation of risotto while in Saudi Arabia, a real cup of Arabic coffee must have saffron and cardamom. The French put them in their bouillebaise and the Moroccans add them to their stews. Saffron is also highly valued for its medicinal properties. It contains many plant-derived chemical compounds that are known to have antioxidant, disease-preventing and health-promoting properties. Many traditional medicines harness the active components for therapeutic applications such as antiseptic, antidepressant, digestive and anti-convulsant. In India, it is used in Ayurvedic medicine to treat a multitude of diseases and in religious rituals too. Knowing all this, you are now ready to fork out big bucks for a pinch of this golden treasure.